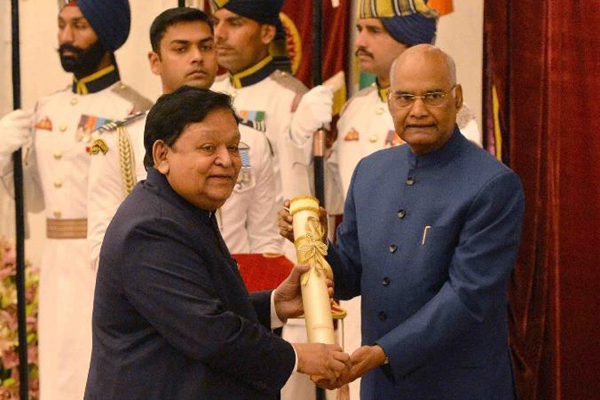 Leading engineering and construction firm Larsen & Toubro (L&T) said its group chairman AM Naik has been conferred the Padma Vibhushan, one of India’s highest civilian honours, by the President of India Ram Nath Kovind. In the company’s long history, Naik is the first L&T official to climb this pinnacle. He has been awarded the Padma Bhushan in 2009, apart from numerous awards from state governments, industry, academia, media and society. Also, he is one of the very few professionals from the field of industry to win this top Indian award. The chandelier-lit hall of the Rashtrapati Bhavan burst into applause as Naik received the award at the hands of the President. A major global industry player, L&T currently operates from 30 countries including GCC countries. Accepting the award, Naik, who belongs to a family of teachers who hail from a tiny village in rural Gujarat, reiterated the sentiments he had expressed when his name featured in the Honours List on Republic Day. "I have always considered myself fortunate to be in a position of service to India and millions of my fellow countrymen. To secure high national honour for such service is a matter of the utmost joy,," he said after receiving the award. "For me, the Padma Vibhushan is also an acknowledgement of the contribution made to the nation, industry and society by L&T – the 80-year old company that I am proud to have served for over 50 years and led for nearly two decades. I thank the Government of India for this honour and use this opportunity to congratulate my fellow awardees who have won recognition in different fields," said an elated Naik. "To receive this high national recognition for my role in industry is an affirmation of my belief that total commitment to a cause, with passion and utmost dedication is destined to win the highest recognition," he stated.